If you don’t end up with leftover corned beef after St. Patrick’s Day, get some at the deli to make this Leftover Corned Beef Reuben Bake. This comfort-food casserole has all the flavors that make reuben sandwiches so good and this low-carb recipe is also Keto, gluten-free, and low-glycemic. Use the Diet-Type Index to find more recipes like this one. 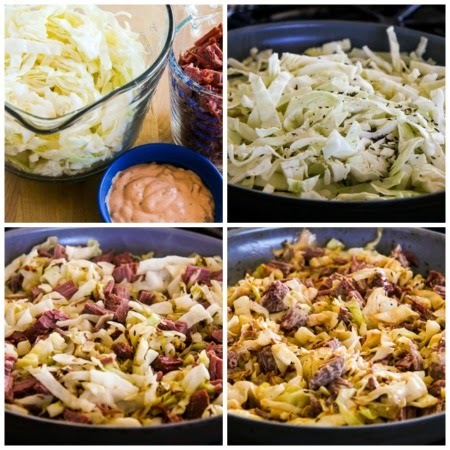 Click here to PIN Leftover Corned Beef Low-Carb Reuben Bake! Leftover Corned Beef Low-Carb Reuben Bake! I’ve certainly tried to encourage you to celebrate St. Patrick’s Day, don’t you agree? I love St. Patrick’s Day, and whether you make my tried-and-true Slow Cooker Corned Beef or use the Instant Pot for Pressure Cooker Corned Beef with Creamy Horseradish Sauce, I really hope you’ll cook some corned beef for the holiday. And of course I’ve already recommended Roasted Cabbage with Lemon as the perfect side dish for corned beef. And if you’re lucky enough to have leftovers after Saturday, I hope you’ll make this amazing Leftover Corned Beef Low-Carb Reuben Bake. But even if you don’t make corned beef (or don’t have any leftovers!) you can some at the deli to make this low-carb casserole that has mashed cauliflower, cabbage, corned beef, swiss cheese, and Thousand Island dressing. If you’re a fan of the Reuben Sandwich, you’ll recognize some of those ingredients and realize how this casserole got its name. This is a recipe I came up with several years ago after I saw a Reuben Bake from My Recipes (probably on Pinterest!) I realized I could easily switch out the potatoes for cheesy cauliflower (and use low-sugar Thousand Island dressing) and make this into a delicious low carb dish. It took me a couple of tries to get the recipe and photos how I wanted them, but when Kara and I tested this final version we gobbled it up. And I’m hoping I don’t sound like I’m completely lacking in modesty if I say this is a complete winner for a way to use leftover corned beef; enjoy! Chop up a largish head of cauiflower and cook 10-11 minutes in boiling salted water. Drain at least 5 minutes to remove as much water as you can, then use an immersion blender or hand beater to puree the cauliflower with the sour cream. Stir in grated Swiss cheese and green onions. I used a deep casserole dish so you could see the layers, but any glass or crockery casserole dish that’s not too small will work. 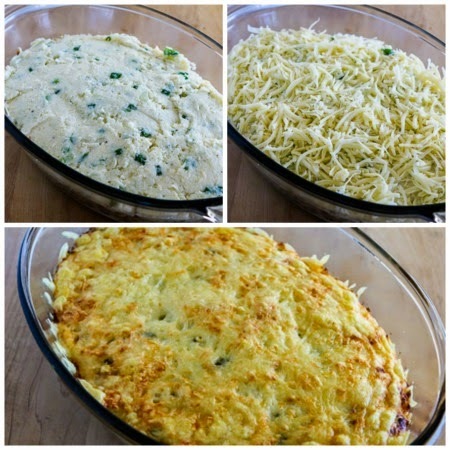 Make a layer with half the mashed cauliflower in the bottom of the dish. Put the cabbage/corned beef mixture over that and top with some grated Swiss Cheese. Then make another layer of mashed cauliflower, spreading it around. Top with another layer of grated Swiss Cheese. Bake at 375F/190C about 45 minutes, or until it’s bubbling hot and the top is starting to brown. Serve hot. I promise this will be a hit with anyone who likes corned beef, even if they don’t care about low-carb eating. If you’re lucky enough to end up with some leftover corned beef use it to make this delicious Leftover Corned Beef Low-Carb Reuben Bake! Preheat the oven to 375F/190C. Fill a pot half fill with water, add a little salt and bring to a boil. While the water heats, trim away the leaves from the cauliflower, keeping the stems; then coarsely chop cauliflower. When the water is nearly boiling, add the cauliflower, turn heat to medium, and cook the cauliflower 10-11 minutes or until it’s barely starting to get tender. (Don’t overcook or the mashed cauliflower will be mushy.) Dump cauliflower into a colander placed in the sink and let it drain at least 5 minutes so it’s not wet. 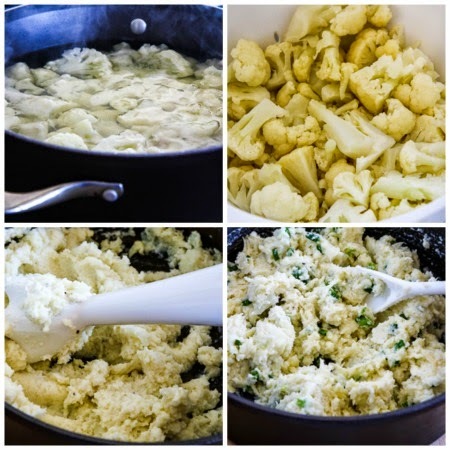 Put cooked cauliflower back into the pan you cooked it in, add the sour cream, and use an Immersion Blender or Hand Mixer to puree the cauliflower. (Don’t overblend; I kept it slightly chunky. Remember it’s going to cook more in the oven.) Mix in the cup of grated Swiss Cheese and the green onions. Remove any wilted outer leaves of cabbage, cut the cabbage into quarters, and cut away and discard the core. Then slice cabbage about 3/8 inch thick. Shred the corned beef apart into strips and chop to make bite-sized pieces. Heat the olive oil over medium-high heat in a large non-stick frying pan (I used my favorite Green Pan to cook the cabbage.) When the oil is hot, add the cabbage, turn heat to medium, and saute the cabbage, seasoning with salt, pepper, and a little caraway seed if using. Cook about 4 minutes, or until it is starting to slightly brown on some edges. Add the corned beef and cook 1-2 minutes more. Turn off heat and let the pan cool down for a minute or two, then stir in the Thousand Island dressing. Spray a large casserole dish with non-stick spray or olive oil. (The dish I made this in was about 9″ x 12″.) Put half the mashed cauliflower into the dish and spread into a flat layer. 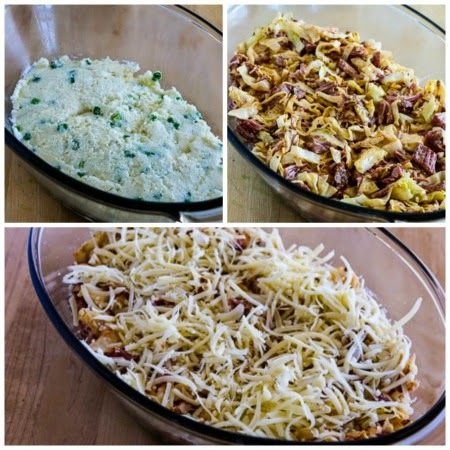 Put the cabbage-corned beef mixture on top of the layer of cauliflower and sprinkle with 3/4 cup grated Swiss cheese. Spread the rest of the mashed cauliflower in a layer on top of that, and sprinkle the cauliflower with another 3/4 cup grated cheese. Bake uncovered for about 45 minutes, or until the mixture is bubbling hot and the cheese is starting to lightly brown on top. Serve hot. For low-carb diets, it’s important to look for Thousand Island Dressing that doesn’t contain a lot of sugar to keep this a low-carb or Keto casserole. (I used Litehouse Thousand Island Dressing with 3 carbs per tablespoon.) Corned beef isn’t really recommended for the South Beach Diet due to the amount of fat, so this is a once-in-a-while treat for South Beach Dieters but I’d certainly make it for St. Patrick’s Day leftovers if you have some. South Beach would also recommend using light sour cream and reduced-fat swiss cheese if you can find it. If you want nutritional information for a recipe, I recommend entering the recipe into this nutrition analyzer, which will calculate it for you. Or if you’re a member of the free site Yummly, you can use the Yum button on my site to save the recipe and see the nutritional information there.